Helping clients become profitable after six months brings smiles to everyone’s faces. 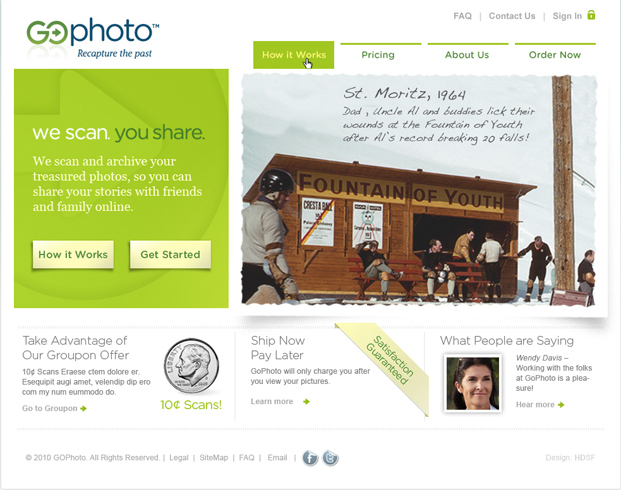 When the founders of GoPhoto approached us soon after starting their company, we were thrilled. They had recently left their jobs to pursue their idea of combining the old with the new: scanning old photos and making them available to share online with family and friends. We helped launch the brand, including the front end interface and programming. Key to the success of the website was the layering of storytelling to personalize the experience, accompanied by old photos provided by the client from their personal albums. And yes, we even added some of our own, including naked bathtub photos (as children, of course). We created a very process-oriented website, which enabled users to easily follow key steps from upload to delivery. Charts and diagrams helped create a simple navigation path and provided a light and friendly feel for the site. We enjoy working with startups – the shared ideas, energy and enthusiasm are all thrown into a cauldron of creativity.